Left to right: Chad Gray (singer), Greg Tribbett (guitarist) and Ryan Martinie (bassist), three of Mudvayne's four members; the fourth is drummer Matthew McDonough. Since 2010, the band has been inactive, with its members performing in other projects and making guest appearances. Chad Gray is the vocalist for the heavy metal supergroup Hellyeah, of which Greg Tribbett was also a member until 2014. Gray founded an independent record label, Bullygoat Records, which produces heavy-metal albums. In early 2015, Chad Gray noted that the band's return seemed very unlikely, unless "everybody licked their wounds and got over it". Mudvayne, formed in 1996 in Peoria, Illinois, originally consisted of bassist Shawn Barclay, guitarist Greg Tribbett and drummer Matthew McDonough. The band's original lineup finalized when Chad Gray, who was earning $40,000 a year in a factory, quit his day job to become its singer. In 1997 Mudvayne financed its debut EP, Kill, I Oughtta. 30 second sample of the L.D. 50 song "Pharmaecopia". To promote L. D. 50, Mudvayne played on the Tattoo the Earth tour with Nothingface, Slayer, Slipknot and Sevendust. Nothingface guitarist Tom Maxwell became friends with Mudvayne vocalist Chad Gray, and they explored the possibility of a supergroup. The following year, Nothingface again toured with Mudvayne; although plans for a supergroup continued, they were put on hold due to scheduling conflicts. Gray and Maxwell had discussed five names for the group, and Mudvayne guitarist Greg Tribbett approached Maxwell "out of the blue" to join it. Although Nothingface drummer Tommy Sickles played on the group's demo, the search for another drummer began. In 2002 Mudvayne released The End of All Things to Come, which the band considers its "black album" due to its largely-black artwork. Isolation inspired the album's songs. During its mixing, Gray and McDonough stopped at Bob's Big Boy and Gray remembered overhearing someone "say something like, ' ... and he's got to cut his own eye out'". When he asked McDonough if he heard the conversation McDonough said he hadn't, and Gray thought it was someone discussing a scene from a screenplay. 30 second sample of "(Per)version of a Truth" from The End of All Things to Come. The album expanded on L.D. 50, with a wider range of riffs, tempos, moods and vocals. Because of this experimentation, Entertainment Weekly called this album more "user-friendly" than its predecessor and it was one of 2002's most acclaimed heavy-metal albums. The music video for the single "Not Falling" demonstrated the Mudvayne's change in appearance from L. D. 50, with the musicians transformed into veined creatures with white, egg-colored bug eyes. In 2003 Mudvayne participated in the Summer Sanitarium Tour, headlined by Metallica, and in September Chad Gray appeared on V Shape Mind's debut studio album Cul-De-Sac. The following year the band began work on its third album, produced by Dave Fortman. As for the previous album, Mudvayne withdrew to write songs; they moved into a house, writing the album in four months before recording began. In February Gray and Martinie expressed an interest in appearing on Within The Mind – In Homage To The Musical Legacy Of Chuck Schuldiner, a tribute to the founder of the metal band Death, but the album was never produced. 30 second sample of the Lost and Found song "Pulling the String". In 2010, Mudvayne again paused to allow Gray and Tribbett to tour with Hellyeah, and because of the supergroup's album releases the band would be on hiatus until at least 2014. With Hellyeah, Tribbett has recorded three albums: Hellyeah, Stampede and Band of Brothers. Gray has contributed to an additional fourth and fifth albums, Blood For Blood and Unden!able. In 2012, Ryan Martinie toured with Korn as a temporary replacement for bassist Reginald Arvizu, who remained at home during his wife's pregnancy. The following year Martinie played bass on Kurai's debut EP, Breaking the Broken, and in 2014 Tribbett left Hellyeah. In a new interview with Songfacts in 2015, Gray said that Mudvayne's return seemed unlikely: "I don’t know if the full band will [ever reunite]. Who knows — they might be putting something else together. We were talking for a while and that whole thing with Greg [Tribbett's 2014 departure from Hellyeah] went down and everything kind of fell apart. Our relationship, which was the only truly solid relationship in the group, although Matt [McDonough] and I are still great, Ryan [Martinie] and I still briefly talk. I mean, the only way I personally would want to do Mudvayne is if everybody licked their wounds and got over it. There's a lot of things in that band that tore us apart. Maybe Mudvayne was the martyr for people that stopped supporting music. You sell 159,000 records the first week, and then the next record is like, 'Whatever, f--k it.' Maybe it's a subliminal message if you don't support things... Mudvayne's probably bigger now than it ever was. So, people want what they can't have." Mudvayne bassist Ryan Martinie is noted for his complex playing. Mudvayne is noted for its musical complexity, complex meters and polyrhythms. The band's music contains what McDonough calls "number symbolism", where certain riffs correspond to lyrical themes. Mudvayne has incorporated elements of death metal, jazz, jazz fusion, progressive rock, speed metal, thrash metal and world music. Mudvayne's influences include Tool, Pantera, King Crimson, Genesis, Emerson, Lake & Palmer, Carcass, Deicide, Emperor, Miles Davis, Black Sabbath, and Rush. Mudvayne have repeatedly expressed admiration for Stanley Kubrick's 2001: A Space Odyssey, and were influenced by the film during the recording of L.D. 50. Although Mudvayne has described its style as "math rock" and "math metal", drummer Matt McDonough said in 2009: "I honestly don't know what 'math metal' is. I made a joke early on in Mudvayne's career that we used an abacus in writing. It seems I should be careful making jokes in interviews. I don't really see Mudvayne as an innovator in anything." Music critics and journalists have categorized the band as alternative metal, experimental metal, extreme metal, hard rock, heavy metal, industrial metal, math metal, metalcore, neo-progressive metal, neo-progressive rock, nu metal, progressive rock, progressive metal and shock rock. Although Mudvayne was known for its appearance, Gray described its aesthetic as "music first, visuals second". When L.D. 50 was released, the band performed in horror film-style makeup. Epic Records initially promoted Mudvayne without focusing on its members; early promotional materials featured a logo instead of photos of the band, but its appearance and music videos publicized L. D. 50. The members of Mudvayne were originally known by the stage names Kud, sPaG, Ryknow and Gurrg. At the 2001 MTV Video Music Awards (where they won the MTV2 Award for "Dig"), the band appeared in white suits with bloody bullet-hole makeup on their foreheads. After 2002, Mudvayne changed makeup styles (from multicolored face paint to extraterrestrials) and changed their stage names to Chüd, Güüg, Rü-D, and Spüg. According to the band, the extravagant makeup added a visual aspect to their music and set them apart from other metal bands. From 2003 up until their dissolution, Mudvayne largely abandoned the use of makeup. ^ a b c d "Former MUDVAYNE Bassist Resurfaces In SPRUNG Project". blabbermouth.net. August 11, 2005. ^ a b c d e f g Sharpe-Young, Garry (2005). "Mudvayne". New Wave of American Heavy Metal. Zonda Books Limited. p. 213. ISBN 0-9582684-0-1. ^ a b "Ryan Martinie". Encyclopaedia Metallum. ^ Dansby, Andrew (September 24, 2002). "New Mudvayne "To Come"". Rolling Stone. Archived from the original on February 16, 2009. Retrieved January 5, 2009. ^ a b c d e f g Bienstock, Richard (2002). "Mask Hysteria". In Kitts, Jeff; Tolinski, Brad. Guitar World Presents Nu-Metal. Hal Leonard Corporation. pp. 79–82. ISBN 0-634-03287-9. ^ a b c d Hay, Carla (April 28, 2001). "No Name's Mudvayne 'Digs' into the Billboard 200". 113 (17): 17, 81. ISSN 0006-2510. ^ Torreano, Bradley. "Review of The Beginning of All Things to End". Allmusic. Retrieved February 26, 2010. ^ McIver, Joel (2002). "Mudvayne". Nu-metal: The Next Generation of Rock & Punk. Omnibus Press. p. 86. ISBN 0-7119-9209-6. ^ a b "Charts and awards for L.D. 50". Allmusic. Retrieved February 24, 2010. ^ Krgin, Borivoj (December 25, 2001). "Review of L.D. 50". Blabbermouth.net. Archived from the original on August 22, 2004. Retrieved February 24, 2010. ^ a b Ruhlmann, William. "Review of L.D. 50". Allmusic. Retrieved February 24, 2010. ^ a b "MUDVAYNE Frontman Sees The (Black) Light". Blabbermouth.net. November 13, 2009. Archived from the original on November 20, 2009. Retrieved November 14, 2009. ^ a b c d Harris, Chris (November 2, 2005). "'Saw II' Eye-Plucking Scene: A Fateful Moment For Mudvayne". MTV News. Retrieved October 5, 2011. ^ a b c d Wiederhorn, Jon (October 24, 2002). "Mudvayne's New Look Coincides With New Sound". MTV News. Retrieved June 19, 2011. ^ Farber, Jim (November 29, 2002). "Music Review: The End of All Things to Come (2002)". Entertainment Weekly (684). ^ Wiederhorn, Jon (October 9, 2002). "Mudvayne Infected By Insects During 'Not Falling' Shoot". MTV News. Retrieved October 5, 2011. ^ a b c d e Montgomery, James (March 2, 2005). "Mudvayne Lose The Makeup, Find Inspiration In Isolation". MTV News. Retrieved January 5, 2009. ^ Doray, Dave (January 9, 2004). "V-Shape Mind's debut disc is pretty solid". ^ "Dave Fortman to Produce New Mudvayne Album". Mix. May 19, 2004. Archived from the original on 2008-01-29. Retrieved October 5, 2011. ^ MTV News (May 28, 2004). "For The Record: Quick News On Justin Timberlake And Usher, T.I., Britney Spears, Paris Hilton, The Vines & More". MTV. Retrieved October 3, 2011. ^ "JAMES MURPHY: DEATH Tribute Album Update". blabbermouth.net. February 24, 2004. ^ Loftus, Johnny. "A Cruel World – Bloodsimple". Allmusic. ^ "ALICE IN CHAINS Tribute Album Report Was A Hoax". August 7, 2005. ^ a b c Paton, James (June 6, 2008). "Concert injuries land promoters, venues in court". Denver, Colorado: Rocky Mountain News. Retrieved January 4, 2009. Nicole LaScalia was knocked to the floor of Magness Arena and trampled by concertgoers moments after the heavy metal band Mudvayne took the stage. ^ Buchanan, Darrin. "Interview with Tom Maxwell". Blistering. Archived from the original on January 2, 2013. Retrieved November 16, 2007. ^ Lymangrover, Jason (October 5, 2011). "By the People, For the People – Mudvayne". Allmusic. ^ "Mudvayne: 'By The People, For The People' First-Week Sales Revealed". Blabbermouth.net. December 5, 2007. Archived from the original on April 22, 2008. Retrieved August 23, 2011. ^ "Chad Gray interview on Type 3 Media (2008)". Archived from the original on April 10, 2008. Retrieved February 21, 2008. ^ "Exclusive: Mudvayne To Drop Two New Albums in Next Year". Headbangers Blog. Headbangers Blog. 2008. Retrieved August 14, 2008. ^ "Mudvayne Drummer Interviewed On 'The Big Dumb Radio Show'". Blabbermouth.net. September 18, 2009. Archived from the original on February 1, 2013. ^ "Mudvayne To Release New Album In December; First Track Posted Online". Blabbermouth.net. October 7, 2009. Archived from the original on October 10, 2009. ^ Monger, James Christopher. "Hellyeah biography". Allmusic. ^ Titus, Christa (June 1, 2016). "Chad Gray: 'I Hope Phil Collins Loves' Hellyeah's Cover of 'I Don't Care Anymore'". billboard.com. Retrieved December 3, 2017. ^ "KORN Bassist Expecting Child; MUDVAYNE's RYAN MARTINIE To Fill In". blabbermouth.net. ^ "MUDVAYNE Bassist's KURAI To Release Debut EP In December". blabbermouth.net. ^ "HELLYEAH Parts Ways With Guitarist, Bassist; Announces 'Blood For Blood' Album Details". Blabbermouth.net. Retrieved 2014-02-13. ^ "Mudvayne Might Never Return, Says Singer Chad Gray". Ultimate Guitar. March 3, 2015. Retrieved April 21, 2015. ^ "MUDVAYNE's RYAN MARTINIE Offering One-On-One Bass Lessons To Fans". blabbermouth.net. February 12, 2009. ^ Kaye, Don (2007). "Review of Hellyeah". Blabbermouth.net. Archived from the original on September 30, 2007. Retrieved June 19, 2011. ^ a b Biamonte, Nicole, ed. (October 28, 2010). Pop-Culture Pedagogy in the Music Classroom: Teaching Tools from American Idol to YouTube. Scarecrow Press. p. 69. ISBN 146167056X. ^ a b c d "Mudvayne Celebrates 15th Anniversary". Guitar Interactive Magazine. July 2017. Retrieved December 5, 2017. ^ Ratliff, Ben (September 28, 2000). "Review of L.D. 50". Rolling Stone. Retrieved February 24, 2010. ^ a b "The End of All Things to Come review". Launch.com. ^ a b c "Intense Mudvayne Will Help 'Heavy Music' Kids Do The Math – Morning Call". Articles.mcall.com. September 22, 2000. Retrieved March 18, 2013. ^ "KAOS2000 Magazine interview with Spag / Matt McDonough of MudVayne". KAOS2000. June 2001. Archived from the original on August 21, 2008. Retrieved October 5, 2015. ^ Beller, Bryan; Westman, Johan (March 9, 2010). "Ryan Martinie of Mudvayne". 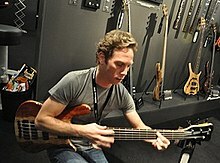 BassPlayer.com. Retrieved July 15, 2018. ^ "Bio". Web.archive.org. February 13, 2003. Archived from the original on February 13, 2003. Retrieved February 2, 2013. ^ Wilson, Scott (August 30, 2001). "Mud Brothers". The Pitch. Archived from the original on September 9, 2012. Retrieved January 5, 2009. ^ a b Sheaffer, Caleb (April 9, 2003). "Mudvayne brings 'tongue-in-cheek' sensibility to BJC show". The Daily Collegian. Retrieved January 5, 2009. ^ "Interview With Matt McDonough of Mudvayne". Sick Drummer Magazine. December 30, 2009. Archived from the original on July 16, 2011. Retrieved February 3, 2013. ^ Monger, James Christopher. "Original Album Classics – Mudvayne". Allmusic. ^ Torreano, Bradley. "Mudvayne – The Beginning of All Things to End". Allmusic. Retrieved June 3, 2014. ^ a b c d e f Dominic, Serene (28 August 2009). "Get to know Mudvayne, here Sept. 2". The Arizona Republic. Gannett Company. Retrieved 28 March 2012. ...Mudvayne has been added to an ever growing list of metals: experimental metal, alternative metal, extreme metal, progressive metal, neo-progressive metal and the impressive pocket protector favorite, math metal. ^ Steve Baltin (October 27, 2004). "Mudvayne Unmask on Lost | Music News". Rolling Stone. Retrieved February 2, 2013. ^ a b "Deftones just want to have a blast". Telegram & Gazette. July 3, 2003. Retrieved January 5, 2009. And fans will witness Mudvayne trying to remake itself from a costume-wearing shock-rock act into a just plain menacing hard-rock act. ^ "Mudvayne Goes Alien For New Album". Billboard. September 25, 2002. Retrieved December 27, 2015. ^ Pareles, Jon (July 10, 2003). "Rock Review; Metallica Thrashes Back to 80's Angst". The New York Times. Retrieved December 27, 2015. ^ Carman, Keith (January 23, 2010). "Mudvayne – Mudvayne". Exclaim!. Retrieved December 27, 2015. ^ Potter, Tina (August 7, 2003). "Heavy metal's best ignite Seattle crowd on Metallica's Summer Sanitarium Tour". The Seattle Times. Metallica, the elder statesmen of metal, assembled an untouchable lineup of metal acts to join them on a tour that reads like a who's who of heavy-metal heavyweights: Mudvayne and the Deftones, Linkin Park and Limp Bizkit. ^ "Archives | The Dallas Morning News, dallasnews.com". Nl.newsbank.com. August 19, 2005. Retrieved February 3, 2013. ^ Weisblott, Marc (January 21, 2003). "Big With the Kids". The Village Voice. Retrieved January 5, 2009. You know Trapt aren't vying for the affections of neo-prog Mudvayne fanatics when their singer, Chris Brown, feels Genesis got good only after Phil Collins took the mic. ^ Phillips, William; Cogan, Brian (2009). Encyclopedia of Heavy Metal Music. Greenwood Press. p. 147. ISBN 978-0-313-34800-6. ^ Udo, Tommy (2002). Brave Nu World. Sanctuary Publishing. pp. 172–174. ISBN 1-86074-415-X. ^ "28 Nu-Metal Era Bands You Probably Forgot All About". NME. Retrieved 13 December 2015. ^ "Mudvayne: Do What You Do (3:30)". Billboard. 120 (42): 46. 18 October 2008. ISSN 0006-2510. ^ Wedge, Dave (December 10, 2008). "There's no masking Mudvayne's prog-metal passion". Boston Herald. Retrieved 4 January 2009. ^ "Mudvayne – News, Music Performances and Show Video Clips – MTV". www.mtv.com. ^ Wiederhorn, Jon (November 4, 2002). "Mudvayne Not Aliens At NY Show". MTV News. Retrieved January 5, 2009. ^ Concorde2 (June 2, 2003). "Mudvayne @ C2 On Monday 2nd June 2003". Brighton News. Archived from the original on December 16, 2008. Retrieved January 5, 2009. McIver, Joel (2006). Black Sabbath: Sabbath Bloody Sabbath. Music Sales Group. ISBN 0-85712-028-X. Wikimedia Commons has media related to Mudvayne.